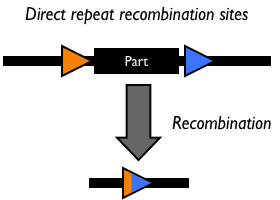 Site-specific DNA recombination requires both a recombinase protein and a pair of repeated DNA sites at which recombination takes place. Depending on the number and orientation of the DNA sites, there can be either an inversion, deletion or insertion of DNA (Figure 1). 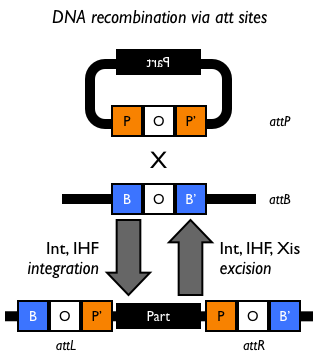 While some DNA recombination systems, such as Cre/lox only require the recombinase and the two DNA sites for recombination to occur, others either require or are modulated by additional accessory factors. If there is a pair of DNA recombination sites (orange and blue triangles) oriented as direct repeats, then intramolecular recombination generally results in deletion of the intervening DNA. The DNA sites may be identical or different depending on the exact recombination sites used. If there is a pair of DNA recombination sites (orange and blue triangles) oriented as inverted repeats, then intramolecular recombination generally results in inversion of the intervening DNA. The DNA sites may be identical or different depending on the exact recombination sites used. Note that these inversion reactions are often bidirectional such that the intervening part can "flip" back and forth over time. The Bacteriophage λ- and P22-derived att DNA recombination systems are particularly well suited for directional, intermolecular recombination. 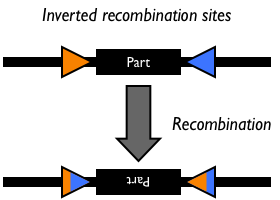 Figure 1: Schematic of different types of recombination events. Site-specific recombination systems derived from Salmonella, different bacteriophages, yeast, and E. coli are all available from the Registry. For more details on individual DNA recombination systems including DNA recombination sites, click the links below.